Abstract: Increasingly, decision making is being informed by access to large amounts of data and statistical analysis. However, many decision makers don’t have formal statistical training. 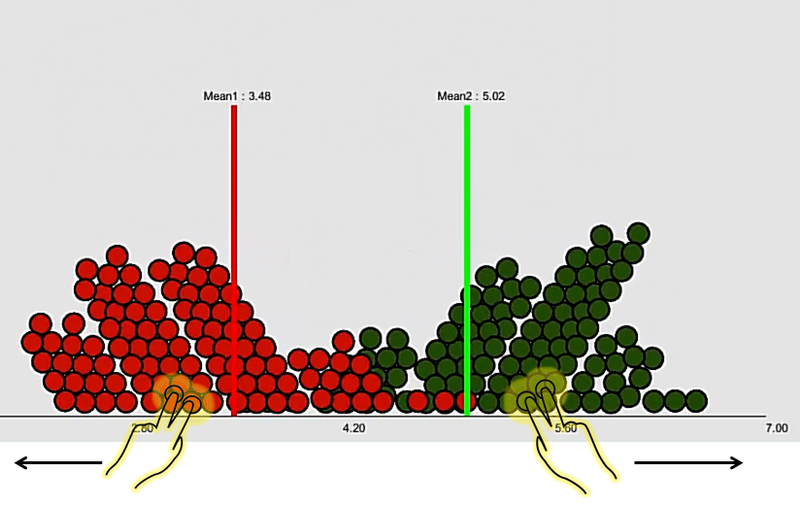 In this paper we propose an interactive system that uses touch and visualizations to accurately communicate statistical concepts to novice audiences. Specifically, we report on the challenges of designing a system to communicate the results of a common statistical comparison (t-tests) to business audiences at a technology company. Our visualization attempts to clarify data anomalies that are often neglected while presenting t-test results (i.e. bimodal data, low sample size and outliers) via data behaviour and inclusion of common physical metaphors associated with communication of statistics (i.e. ‘pulling out outliers’). Our iterative design process ultimately led us to draw upon data physicalization techniques such as constructive visualization in order to inform our solution. S. Somanath, I. Hargreaves, E. Tse, K. Takashima and E. Sharlin, “Grasping the t-test: Designing an Interactive System to Communicate Statistics” , Workshop 'Exploring the Challenges of Making Data Physical' at the ACM Conference on Human Factors in Computing Systems (CHI'15). 2015. Seoul, Korea.